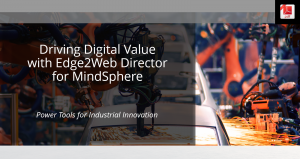 This page provides content related to a webinar hosted by Edge2Web and Siemens on 23rd January 2019 entitled Driving Digital Value with Edge2Web Director for MindSphere. The webinar gives an overview of the MindSphere platform services and use cases, and discusses Edge2Web Director’s bi-directional integration with MindSphere services. The webinar includes a review of Edge2Web Director pricing, as well as a tour of applications created with Director for MindSphere. Note that all webinar questions are answered in full in the Q&A section beneath the webinar links. Sign up for a 30-day Edge2Web Trial and put your IIoT projects into overdrive! What are typical IIoT starter use cases? Bill Boswell from Siemens PLM answered this question. Getting started by connecting devices is easy and fast, especially where you have devices that are already generating data in OPC UA or one of the other common formats. Regardless of your application, I would recommend you start by picking a business case you want to address, such as monitoring realtime results, asset performance management, we've seen in this webinar examples of Edge2Web dashboards and apps that show different starter use cases. It is not expensive to get started with a platform like MindSphere, so you can pick a business case you'd like to address and just try it. The key thing is to start with an end outcome in mind, and that's something Siemens or one of our partners can help you with as well. Can Edge2Web apps write events to the MindSphere event store? Fred Holahan from Edge2Web answered this question. So the short answer is yes, absolutely. The expanded answer is that logging user events is a fairly common requirement. For example, an Edge2Web application might guide a plant engineer through a complex troubleshooting process, logging each decision the engineer makes in the MindSphere event store. This resulting events can be used in downstream analytics as well as to fulfill audit requirements. Where can I learn more about the MindSphere APIs? Can I deploy different Edge2Web apps to different user audiences? Yes, we covered this briefly on slide 25 of the webinar. Regardless of whether you provision your applications to your own operator tenant or our operator tenant, Edge2Web provides you with access controls to manage which users have access to what application pages. So if you have one page you want all of your users to see, you can easily make that available to everyone. If, in another example, you’ve built pages specifically for one of your sub-tenants, you can easily limit the visibility of those pages to that sub-tenant or even specific users within that sub-tenant. So you have a lot of flexibility about what application components are published to your user audiences. Do you have a plan for educational institutions? Please check with your local MindSphere sales team to learn more about MindSphere Academic Program offerings. The Edge2Web Director Academic Program is currently under construction. Our goal is to put this program in place during Q1 2019. We will announce program details as they become available. Can I add more users to an Edge2Web subscription plan? Yes, we offer in-plan user upgrades in increments of five users. User upgrade packs are $3k/year for Enterprise plan subscribers, and at the applicable plan discount rate for OEM users. User upgrades can be provisioned to your Edge2Web tenant at any time during your subscription year. How does Edge2Web integrate with non-Mindsphere apps and data sources? Director can communicate with any REST service that uses Swagger to describe its endpoint(s). If the services you need to access do not include Swagger metadata, we will assist you in creating an appropriate Swagger descriptor so your services are accessibel to Director. Edge2Web also includes built-in connectivity to a wide range of SQL and NoSQL databases, middleware protocols, and enterprise messaging systems including Oracle Database, Microsoft SQL Server, PostgreSQL, MySQL, Apache Cassandra, Hadoop HDFS, MongoDB, RabbitMQ, and many others. Siemens offers several of these products as MindSphere backing services, making it even easier to integrate them with your Edge2Web Director applications. No MindSphere data is persisted anywhere by Edge2Web Director. The only user data stored on Edge2Web is data you optionally choose to upload in Excel or CSV format, or test data you save with your Edge2Web design artifacts. If you choose to upload flat files or save test data with your Edge2Web components, you can easily delete it at any time.